Germ-free mice are protected from TLR9-mediated cytokine storm. Conventionally housed and germ-free C57BL/6 mice were treated with 5 doses of CpG1826 over the course of 10 days. 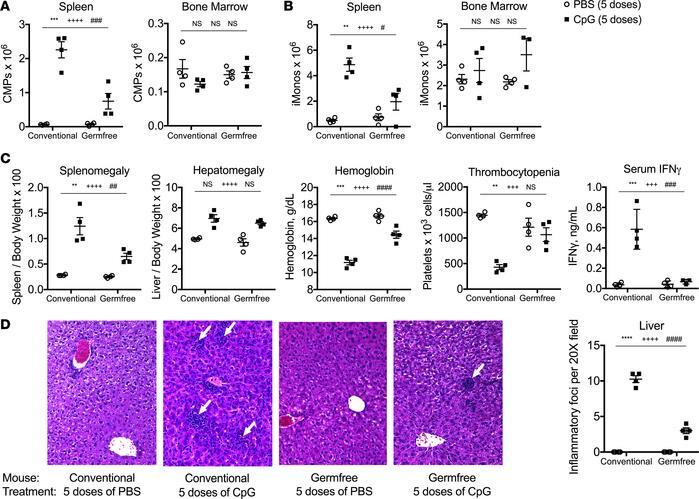 (A and B) Numbers of medullary (bone marrow) and extramedullary (spleen and liver) common myeloid progenitors (CMPs) and inflammatory monocytes (iMonos) were enumerated. (C) Clinical manifestations of cytokine storm were evaluated by measuring splenomegaly, hepatomegaly, anemia, thrombocytopenia, and serum IFN-γ. (D) Livers from mice were sectioned and stained with H&E (original magnification, ×20). Each graph displays representative data from 1 of 2 independent experiments (n = 4 mice per group). Analysis was performed by 2-way ANOVA (**P < 0.01, ***P < 0.001, ****P < 0.0001, interaction; +++P < 0.001, ++++P < 0.0001, conventionally housed vs. germ free; #P < 0.05, ##P < 0.01, ###P < 0.001, ####P < 0.0001, PBS vs. CpG in vivo treatments). Interaction term is CpG treatment x housing condition.